Josephine Munene is a Kenyan living in Nairobi City. 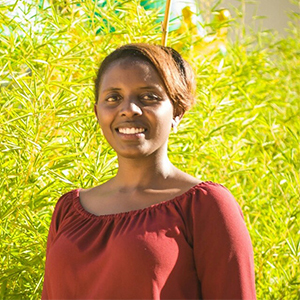 Her work experience has revolved around Community Health Education Programs, specifically nutrition, HIV/AIDS and sexuality. She has worked for Procter and Gamble hospital sampling program under HDI Youth Marketers and Crown the Child Africa. She has also volunteered as a Life Skills Trainer at I – Choose – Life Africa in tertiary institutions. She has also trained and served as a Peer Educator for I-Choose-Life and Resources Oriented Development Initiatives(RODI Kenya) in various Kenyan prisons. She holds a Bachelor’s Degree in Food Nutrition and Dietetics from Kenyatta University. Currently she is pursuing a Post Graduate Diploma in Counselling Psychology at Amani Counselling Centre and Training Institute (ACCTI). Her vision as a changemaker is to design Mental Health Wellness programs that target young men and women in higher learning institutions and in the workplaces to allow for them optimize their potential by through Life Skills Training. Her motivation to join Amani was to acquire skills in social innovation and enrich her global outlook and collaborations.